At the SC17 trade show, Micron is demonstrating several currently unavailable products for the enterprise market. Among other things, the company is showcasing its upcoming Micron 9200 ECO U.2 SSD with 11 TB capacity as well as an 8 TB drive that belongs to the Micron 5100-series. The Micron 9200 family of SSDs was introduced earlier this year and was designed for applications with different requirements for performance and endurance. The drives are based on the company’s 32-layer 3D TLC NAND memory and will be available in capacities ranging from 1.6 TB to 11 TB. 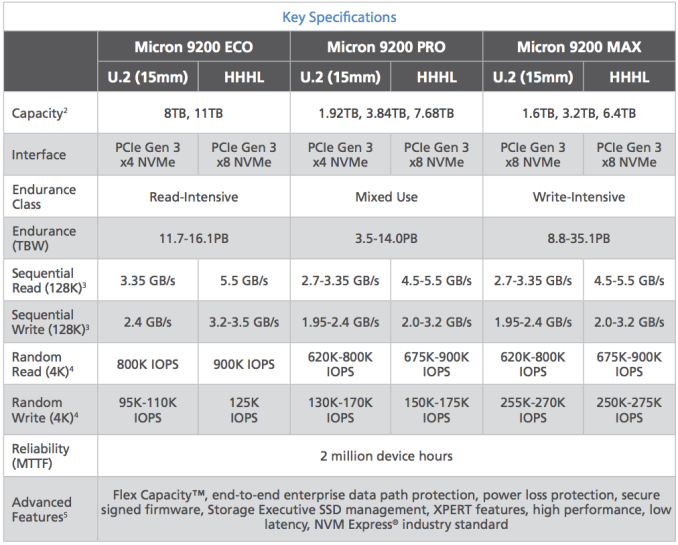 The Micron 9200 ECO is the latest addition to the lineup that is aimed at write-intensive applications and will be available in 8 TB and 11 TB configurations with rated endurance of 11.7 and 16.1 PB, respectively. As for performance, we are dealing with devices capable of 3.35 GB/s – 5.5 GB/s sequential read speed as well as 800K and 900K random read IOPS, depending on the interface used (PCIe 3.0 x4 or x8). 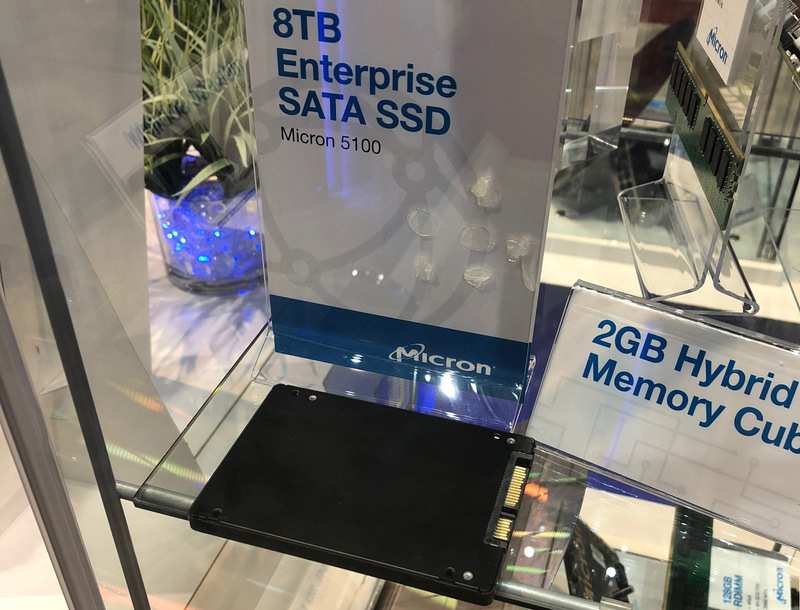 When Micron announced the new 9200-series drives at FMS this August, it did not showcase pictures of the SSDs; but at the SC17, the manufacturer is displaying the Micron 9200 ECO in the U.2 form-factor, indicating that the product is in production getting closer to the release. Unfortunately, there is no firm launch date just yet. UPDATE 11/17: Micron said in an email that as of November, all of its 9200-series U.2 SSDs were in production. In addition to the 11 TB U.2 drive, the company is demonstrating an 8 TB version of the Micron 5100-series, which has not been introduced officially. The Micron 5100 family is based on the company’s 32-layer 3D TLC NAND flash as well as Marvell’s 88SS1074 controller. The highest capacity officially featured by the Micron 5100 lineup is 7680 GB. The Micron 5100 ECO 7.68 TB drive carries 8 TB of raw NAND, but reserves 320 GB for overprovisioning and other needs. It is unknown whether the SSD that Micron is displaying at the SC17 is indeed the 5100 ECO 7.68 TB marked differently, or Micron is getting ready to offer a new configuration because of demand from various partners.